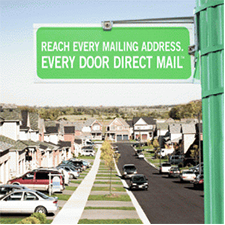 For quality EDDM (Every Door Direct Mail), Bargain Printing offers a complete solution supported by our bundling services. Whether you are looking for single or double sided EDDMs, full color for more impact, Bargain Printing has you covered. Bargain Printing prints on a heavy 16 pt card stock that complies with the USPS mailing requirements. Remember, the heavier the stock, the better the card, because it stands out from the crowd. Let’s take a look at the research. According to the Direct Mail Association (DMA) Factbook for 2013, 65% of consumers of all ages have made a purchase as a result of direct mail. You could think, with all the online marketing tools in the box, this classic approach might not get you to your next sale, but with a longer shelf life than email along with a great chance to feature your website address, direct mail can make an impact. With a response rate in excess of 4% these days, it just might be time to use EDDM for your next event. Do you have a new website to promote? How about a seasonal sale? Or a new E-newsletter? A new product line? By combining your online branding with EDDMs, you can make sure you have sent out the complete package and your bases are covered. What a great opportunity to get your message in the mail and in the door! Communicate with your customers in a direct mail that they can use to come right back to you: you feature your web address, your phone number, your products. 6.5" x 9" 4.5" x 12" 8.5" x 7" 8.5" x 11" 9" x 12"
Bargain Printing will bundle your postcards so all you have to do is take them to the Post Office. Pieces will be bundled in groups of 100.